Ready to use, pre-cut earthing cable that facilitates both procurement and installation. For earthing between metallic parts. 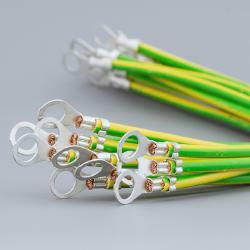 6 mm² copper wire (yellow-green). Add connection set ECF for fixing cable to painted frame. 6mm2 copper earthing cable pre-cut with preassembled connectors. The cable is ready for use and can be easily installed between sections of the enclosure. Ready to use cables ensure that both procurement and installation can be done efficiently.